I was born in Split but my family lives in Maslinica since the year 1706. It is a beautiful South-facing village with its fishing harbour, its tiny marina, its authentic small restaurants, and its preserved nature. It is ideal for a quiet and safe family holiday. You could also visit Trogir and Split on the same day as Solta is quite close to the continent. You will find direct connexions to Trogir (30-minute zodiac drive). I can help you with the boat rentals in Trogir. It is then possible to wait for you at the airport of Split and to bring you in Maslinica (30-minute zodiac ride). The setting is beautiful, the view is exceptional, and the quality of the villa is unique on the Island. I can put you in touch with friends who rent zodiacs and who can pick you up at the airport of Split (on the pontoon) and bring you to Maslinica in 30 minutes. Perfect stay on the island! The place has it all. Sea, sun, comfort and safety. One of the best spots on the Solta island. Private, under the pine trees on waterfront. We stayed for two weeks, family of five. Walking distance to Maslinica, sometimes rather busy small port of popular yachting destination. Looking forward for next stay and highly recommend! Beautiful house on beautiful island. Like on the photos. We had everything in the house but we were mainly outside on the terrace, in the garden, on the beach, … We observed the nature around us: listened the sound of the sea, enjoyed the presence of turtledoves and redstarts and their singing, watching the seagulls flying, resting surrounded with pine, carob and olive trees, bathing in fresh, clean Adriatic and sunbathing practically all the time - that was the wellness and the spa we thankfully accepted and really appreciate. We had our peace and quiet because the house is just outside the village, but 5 min walk from all the restaurants and shops. Easy seven days. Love to come again. Stéphane's house in Maslinica is just perfect. It is all modern with the necessary amenities for daily life. 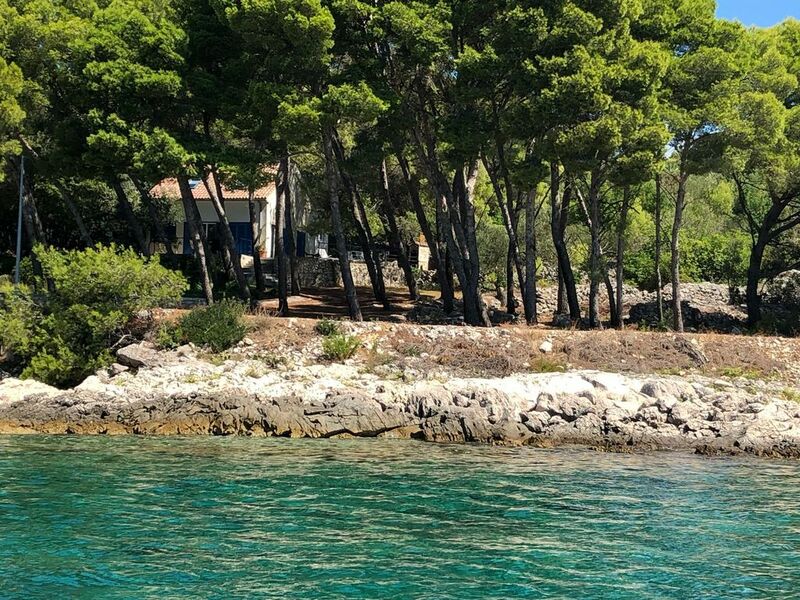 The garden with the pine trees, the sea view and the Croatian BBQ is beautiful. The sea right in front of the house is crystal clear. Maslinica, the village close by is very nice and has a good choice of decent restaurants. We are already planning our next trip to Maslinica. Thanks for this beautiful review from GERMANY ! Hope to see you next year in MASLINICA ! Comfortable and quiet house: rooms, kitchen, BBQ, outside furniture, silent at night (and day), surrounded by pine forest. Excellent location: 5 minutes walk from the port of Maslinica, where you have some nice restaurants and a supermarket. If you have a little boat you can visit nearby beaches and bays, as Solta is full of them. Radman family will help you in everything that you should need to make yours a special stay. I would recommend it to anyone, except if you don’t feel comfortable walking to the village. We will repeat the experience!! "The perfect spot to spend a few days (weeks would be better) on the sea side, 5 minutes walk from a charming mediterranean fishermen harbour. The house is the one you're dreaming of (view over the sea and an little island. Very well equiped, plus a little boat, plenty of beach tools (snorkle, fishing canes...) The owner's are very nice people. Higly recommanded."